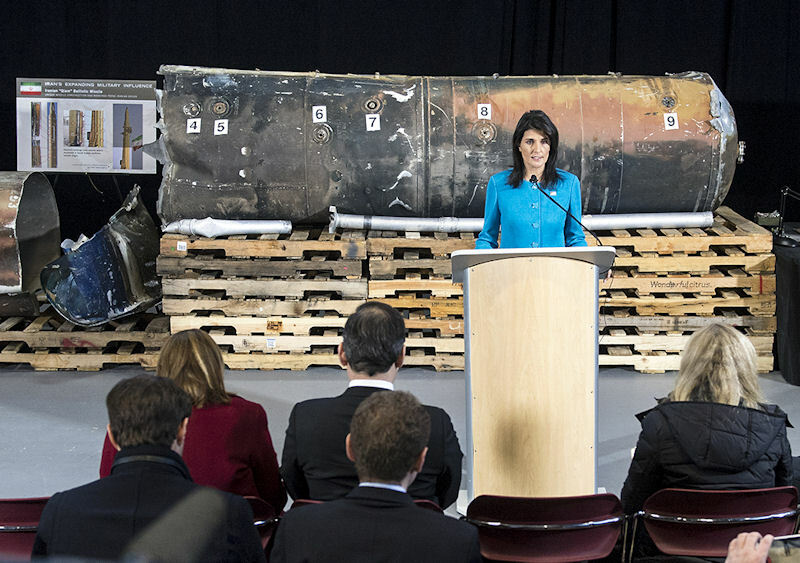 On 15 December 2017, the US Ambassador to the UN displayed 'undeniable' evidence of an Iranian missile fired at Saudi Arabia by fighters in Yemen. Nikki Haley said the missile parts point to Iran's violation of an international arms agreement. Iran said the allegations were 'unfounded, irresponsible and provocative'. Iran's foreign minister compared Haley's presentation with another by former US Secretary of State Colin Powell. This speech at the UN Security Council in 2003 about Iraq's weapons of mass destruction turned out to be false. Haley said the White House planned to rally international support to crack down on Iran. The Houthis operate a variety of short-range tactical ballistic missiles, including the Soviet designed Scud-B [North Korean Hwasong 5], the Soviet Tochk. Houthi forces have used Soviet SA-2 SAM missiles as surface-to-surface weapons, calling the "new" missile “Qaher-1.” The Houthis acquired Iranian Zelzal-3 missiles which they have fired into Saudi Arabia. The Houthis appear to operate at least three variants of the Scud, under the Burkan (Volcano) nomenclature. The ballistic missiles the Houthis had used by the end of 2017 included the Burkan 1, Burkan 2, and Burkan 2H. The Burkan 1 is very similar to an Iranian Shahab 1 or 2 and the North Korean Hwasong-5, which are Scud-B knock offs. The Burkan-2 is distinguished by a new "shuttlecock" payload section, as opposed to the simple conic warhead of the Burkan-1. The Burkan 2 was claimed to have a longer range, up to 1,000km. The Burkan-2H retained the "shuttlecock" payload section, but also deleted the tail fins seen on the earlier variants. The Burkan 2H appears to be an Iranian Qiam. The latest version had “significant design differences” from the Scud C and Hwasong-6 missiles, which are fashioned with heavy steel exterior that slows its trajectory. In contrast, the Houthi Borkhan H-2H was made with a lighter aluminum skin and a more advanced guidance system that negated the need for tail fins used on other Scuds. There is no indication that the Houthis have acquired the longer range Shahab-3, with a range of 1400 km. Ambassador Nikki Haley, U.S. 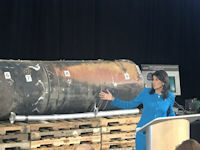 Permanent Representative to the United Nations, on December 14, 2017 gave a briefing at Joint Base Anacostia-Bolling in Washington in front of the recovered pieces of a missile fired by Houthi militants from Yemen into Saudi Arabia. The missile’s intended target was the civilian airport in Riyadh, through which tens of thousands of passengers travel each day. She said " It is missing the large stabilizer fins that are typically present on these kinds of missiles. 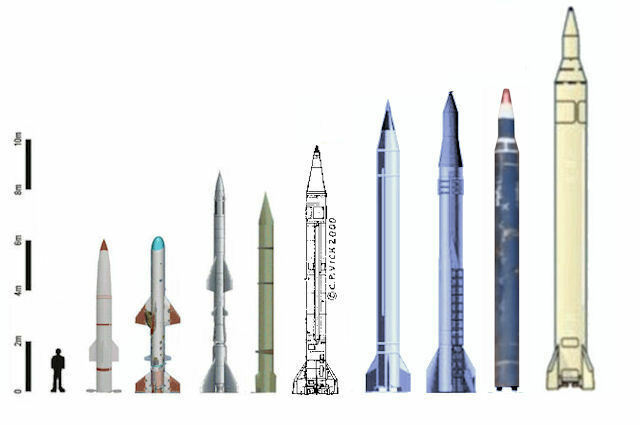 The Iranian Qiam missile is the only known short range ballistic missile in the world that lacks such stabilizer fins and includes nine valves that you will see running along the length of the missile. Those valves are essentially Iranian missile fingerprints. On your walk through, you will also see missile debris stamped with the logo of Shahid Bagheri Industries, an Iranian manufacturer." The Kingdom of Saudi Arabia welcomed the report of the United Nations, which stressed that Iran’s hostile interventions and support for the Houthi terrorist militias with advanced and dangerous missile capabilities threaten the security and stability of the Kingdom and the region, reported the Saudi Press Agency (SPA). The Kingdom also welcomed the American position announced by the United States Ambassador to the United Nations, Nikki Haley, and its condemnation of Iran’s hostile activities in supporting and arming terrorist groups, including Hezbollah and the Houthi terrorist organizations. The Kingdom of Saudi Arabia charged that Iran’s actions constituted a flagrant violation of Security Council resolution 2216 [14 April 2015] and Security Council resolution 2231, which has disrupted the political process and prolonged the crisis in Yemen. This resolution imposed sanctions, including a general assets freeze, travel ban and arms embargo, on Abdulmalik al-Houthi, who it called the Houthi leader, and Ahmed Ali Abdullah Saleh, son of the president who stepped down in 2011. The Security Council in paragraph "14. Decides that all Member States shall immediately take the necessary measures to prevent the direct or indirect supply, sale or transfer .... from or through their territories or by their nationals, or using their flag vessels or aircraft, of arms and related materiel of all types, including weapons and ammunition, military vehicles and equipment, paramilitary equipment, and spare parts for the aforementioned, and technical assistance, training, financial or other assistance, related to military activities or the provision, maintenance or use of any arms and related materiel, including the provision of armed mercenary personnel whether or not originating in their territories..."
Saudi Arabia also condemned the Iranian regime for violations of other international resolutions, including Security Council resolutions 1559 and 1701, which prohibit supplying weapons to any extra-state militias in Lebanon (under Chapter VII), as well as Security Council resolutions 2231 and 2216. 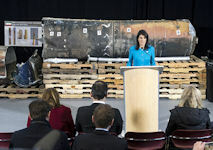 “Furthermore, Haley had to provide compelling reasons why, given that Yemen is under the most severe international sanctions in sea, air and land, Iran has managed to move a large number of these missiles there,” underlined the official. Iran noted that " at the time of the outbreak of the war in Yemen in 2015, the country had an estimated 300 SCUDs. Some of these munitions, reportedly modified by Yemeni engineers, have been fired at Saudi Arabia in retaliation for the countless air strikes over the past two years. .... the UN panel tasked with investigating Saudi and US claims of Iranian missile transfers to Yemen has neither found evidence of such supposed deliveries nor proof of foreign assistance with the use of such weapons. On the contrary, the panel has established that exclusively Yemeni experts fired the missiles in question, and that no missile components are likely to have been smuggled into the country via the Red Sea - directly contradicting the Saudi rationale for blockading Yemen. Curiously, the UN panel has reportedly found both US and Iranian components in the said missile fragments. On the basis of the logic presented by Saudi Arabia and the Trump administration, both the United States and Iran are thus apparently aiding Yemenis in their missile development." Tehran denied arming Iranian-allied Shiite Houthis against the Saudi-led coalition which seeks to restore President Abd Rabbu Mansour Hadi, who was ousted by Houthis in September 2014. The chief commander of Iran's Islamic Revolution Guards Corps (IRGC) said in November 2017 that the Islamic republic provides "advisory assistance" for Yemeni Houthi militants. 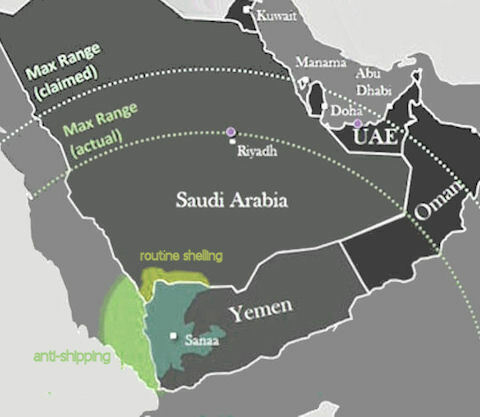 The types of missiles employed by the Houthis and their ranges are a bit of a puzzle. The Shahab-2, based on the Scud-C, has a range of about 500 km with a 720-kg warhead. Iran had developed a Shahab-2 variant in 2010 to create the finless Qiam missile, which was estimated to have a range of at least 800 km with a detachable warhead. These range estimates are appreciably less than the ranges attributed to counterpart Houthi missiles. The Houthi-affiliated Al-Masira TV reported 03 September 2016 the Burkan-1 (Volcano-1) ballistic missile, an upgraded SCUD, had a range of over 800 km. The range from Sa'dah [16°58'N 44°43'E], the capital city of Saada Governorate in north-western Yemen, is probably more like 700 km to Jeddah, and 900 km to Riyadh. The distance to these targets from the Al Wadeeh border crossing [16.94N 47.01E] is about 900km. The range from Sanaa to Riyadh or from Sanaa to Jeddah is equal to about 1,000 km. Saudi Arabia and its allies have been at war in Yemen since March 2015, when the oil-rich kingdom intervened to push back the Houthis - who control the Yemeni capital, Sanaa - and reinstate the government of President Abd-Rabbu Mansour Hadi. The Houthis inflicted a drizzle of missiles on Saudi Arabia since then, but only began firing the longer range Burkan-2H / Qiam-1 in late 2017. Although superficially similar to the Burkan-1 and Burkan-2, the Burkan-2H is of entirely different construction [eg, aluminum rather than steel construction], and cannot be the product of a modification of these earlier designs. The Burkan-2H / Qiam-1 design appears to be exclusive to Iran, and does not appear to have a North Korean counterpart. Prior to the civil war, the DPRK was the source of Yemen's missiles. There is no apparent reason for the Houthis to have withheld the Burkan-2H for over two years, if this missile was already in Yemen's inventory at the start of the civil war. 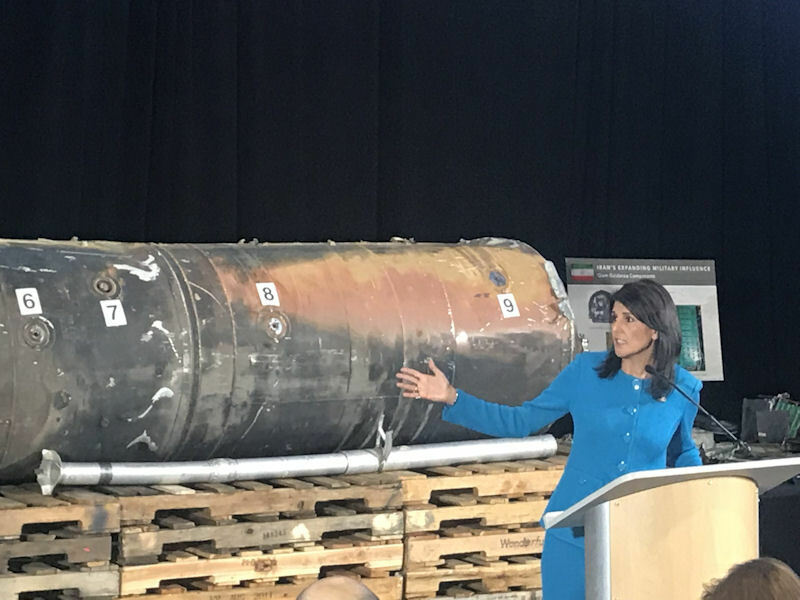 A more plausible story line is that Iran managed to transfer these missiles to the Houthis when Yemen's legacy inventory of shorter range missiles proved unable to reach strategic targets in Saudi Arabia, such as Jeddah or Riyadh. The Qiam-1 missile was first paraded in Tehran in 2010. At that time, Iran-Yemen relations were rather testy, as Yemen's government offered public and widespread allegations of direct Iranian support for the Houthi rebels. On 15 November 2009, Iranian Foreign Minister Manuchehr Mottaki told Al-Jazeera that Iran harbored no ill will towards Yemen and hoped to offer mediation services in the civil war. Offers by Iran to mediate between the Yemen's government and the Houthis in the Sa'ada conflict did nothing to assure Yemen of Iran's good intentions. Any hint that the government of Iran has influence with the Houthis has actually helped to further convince Yemen that Iran had ties to the Houthi rebels and aims to interfere in Yemen's internal affairs. At that time, Yemen was quite persistent with allegations of Iranian infiltration, assistance to the Houthis, and destabilization of Yemen. 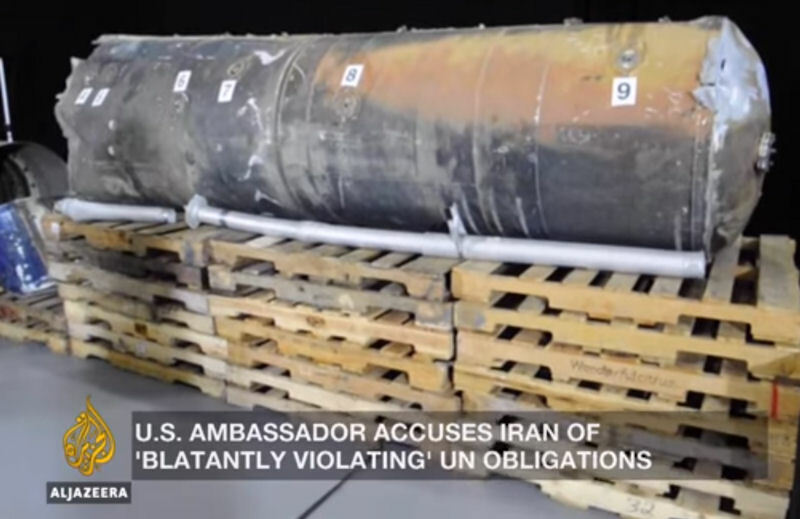 Under these circumstances, it is implausible that Iran would have sold the Qiam-1 to the government of Yemen after 2010, or prior to 2015, when the UN arms embargo was enacted. 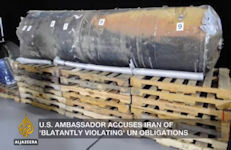 The Iranian claim that "it needs to be attested that Iran had secretly transferred the missile to Yemen only after adoption of the Security Council sanctions" is spurious, as any such evidence would have been actionable intelligence that would have prompted an interdiction of such a shipment. The best available evidence is the flaming datum of the missile launch.